Keep following-up non-renewing members by asking for an update on how they are doing, inspiring them with the possibilities provided by Pathways and . Late renewals submitted during April will count towards the 5 members target. Upgrade your club’s marketing presence, by for example adding it to Google Maps, posting regular updates with photos and videos on social networks and handing out flyers to members of the public. Make your guests feel welcome by sitting them next to a members. By explaining how Toastmasters works and by handing them guest-packs. Your guest pack could contain some information, a ‘Welcome to Toastmasters’ ribbon, a magazine and anything else you can think of. Ensure that your meetings start and finish on time and that members perform their roles to the best of their abilities. What makes Toastmasters stand out from other organisations, is the structure of our meetings and the fact that our members do more than just speaking. Ask your guests for feedback on the meeting and provide them with an opportunity to say a few words during the meeting. Use some of these 100s of membership building ideas collated by fellow Toastmasters in the United States. A while back Andy and I shot this short video on the benefits of Pathways. Feel free to share it far and wide, especially to former members or members unsure to renew. 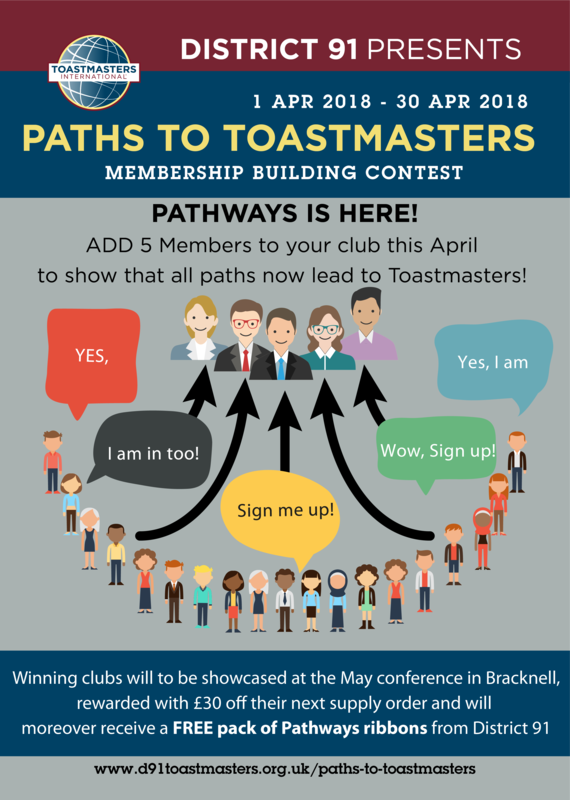 You too can show that this April all paths now lead to Toastmasters!